Christmas is upon us, so don't forget your sleeping bag and favorite pillow when going to family's and friends' houses. It's rude to pass out on the couch, after all. Ever wonder why it is we get so sleepy after eating a big holiday meal? 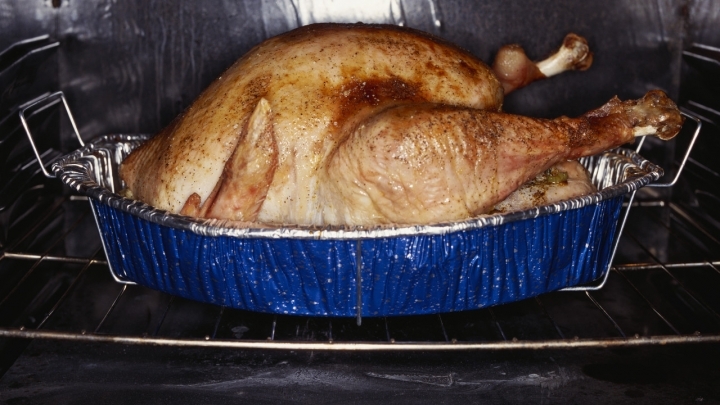 Unless you're vegetarian, chances are you will probably eat some turkey, which is filled with tryptophan. This so-called essential amino acid (meaning the body needs the amino acid but cannot produce it on its own) helps the body produce the B-vitamin niacin, which, in turn, produces the chemical seratonin that plays a key role in calming the brain and in sleep. This discovery led scientists to create a tryptophan supplement to treat insomnia in the 1980s. In 1990, however, the U.S. Food and Drug Administration (FDA) banned the supplement because of a reported link to eosinophilia-myalgia, a syndrome that causes muscle pain and even death, resulting from contaminated batches. Don't fret, however. Turkey won't kill you this holiday season. According to nutritionists and other experts, the tryptophan in turkey won't trigger the body to produce more seratonin than it can handle since it has to compete with a host of other amino acids the body uses, meaning only a portion of tryptophan makes it to your brain. Besides, tryptophan works best on an empty stomach -- and who has one of those this time of year? Stil, some scientists contend the turkey-tryptophan-and-sleep connection to be nothing but a fabled holiday myth, on par with poisonous poinsettias and increased Christmastime suicides. Most meats have tryptophan, after all, and cheddar cheese has even more. Yet no one really equates cheddar cheese with sleep. Carbohydrate-laden holiday dinners containing an abundance of calories far exceeding recommended values may be to blame for all that yuletide lethargy, instead. Potatoes au gratin, casseroles, cakes, pies -- that's enough to induce a deep sleep just short of a diabetic coma. Add your uncle's childhood stories to the mix, and you can forget about staying awake to catch the game on TV. What scientists can agree on is the vital role amino acids play in our daily diet. Amino acids are organic compounds containing both an amino group and a carboxyl group. There are ten essential amino acids the body cannot produce on its own: arginine, histidine, isoleucine, leucine, lysine, methionine, phenylalanine, threonine, the aforementioned tryptophan and valine. An adequate diet must contain all of these. Often they are found in meat and dairy products, but can also be supplied by cereal grains (such as wheat, corn and rice) and legumes (beans and peanuts). Popular ethnic dishes often involve a combination of these ten essential amino acids, including Cajun rice and beans, and Japanese rice and soy beans. So even though tryptophan may make you a little groggy, it's important to get enough of the amino acid outside of the holiday season as well. A diet low in essential amino acids can result in serious health implications. Muscle and other protein structures in the body can be compromised in order to obtain just one of the amino acids missing from your diet. Unlike fat and starch, the body doesn't store excess amino acids for later use.